By the time I was on my 20th playthrough of the first level of Assault Suit Leynos PS4 - one of just eight levels in a game shorter than most arcade classics from the 1990s - it struck me that modern players might think this was one of the worst games of 2016. Leynos does not conform to modern ideas of gaming fairness nor modern gaming brutality. People love relatively cake walk-esque roller coasters like Uncharted. People also seem to love games like Dark Souls where you’re repeatedly bludgeoned by some kind of drooling freak just for walking into a room, only to try it again and again until you know how to avoid a bludgeoning. People appear to love cruel action like Galak-Z and Enter the Gungeon seemingly inspired by ‘90s classics, but even those communicate clearly why you suddenly fail. In Assault Suit Leynos, though, the game loads, you push your stubby little mech suit that looks litigiously like a Gundam, and the first time you meet another mech you will explode. It will not be clear why. It will still not be clear why you keep exploding after you learn to switch between your mech’s different guns and how to dash forward and use your shield. This will mystify the people who love those types of games, but if they persevere, if they learn what Leynos is trying to tell them, they will fall deeply in love. Leynos isn’t just mimicking an era of design. It’s actually a remake of a Sega Genesis game from 1990 that even by the standards of the time was particularly brutal and demanding. Rather than the sort of crowd pleaser action game where you’d simply run from left to right blowing up whatever aliens or robots showed up, Leynos tried to marry that run-and-gun style with more tactical considerations that were part and parcel of ‘80s mecha anime. The game still looks like a Contra, but it can’t be played like one; hence all the blowing up. The only way to succeed in Leynos is to take it slow at first, learning precisely how to move and just what the limited weapons you have at the start can do. That first level is enormously intimidating. All you have is a shield, a puny machine gun that can blow up enemy mechs pretty well but requires frequent reloading that leaves you vulnerable. There’s a slow shotgun and a sort of grenade launcher that fires an array of small electricity bombs in an arc into the air. Figuring out how to use just these three tools to actually stay alive as enemy mechs trundle endlessly towards you and blowing up a massive spaceship in the sky above you before it reaches your home base in just 60 seconds legitimately seems impossible at first. You’re as fragile as a paper airplane and your weapons are crap: what to do? Try, try again. The repetition forces you to rethink video game nimbleness, where you always need to be planning a few seconds ahead for where your robot suit will be and where it can fire. It took me almost 45 minutes to beat that first level for the first time, and the reward was no weapons, a little bit of armor, and a greater understanding of what the game expected of me. The eight levels that follow are all significantly different than that first level. Leynos never asks you to do the same thing twice, though it does expect you to play many, many times. Some levels take place in space and you have to protect your fleet while flying around. Others have you invading a power plant, trying to survive as your reach the core but also saving enough precious ammunition - there are no refills - for your heavy weapons to actually destroy it. Each success unlocks new gear which can entirely change the pace of levels when you tackle them again on a harder difficulty. From the outside it can seem needlessly laborious and repetitive, but there’s a rare pleasure in trying these stages over and over again. Modern action games have different considerations than Assault Suit Leynos, but not necessarily better ones. The pace of this game is enhanced by the great soundtrack and gorgeous HD sprite work. (Leynos has to be seen in motion to appreciate the jointed, brightly colored art. In still screenshots it looks like a crap Flash game from 2007, but in motion it looks like a cross between a comic book and a puppet show coming to vivid, weirdly jointed life.) 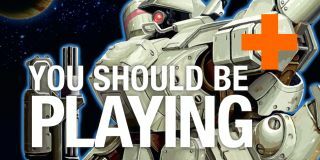 Anyone who longs for an action game that offers an unusually strong sense of accomplishment or has a penchant for 30 year old mech art or just wants something different than the roguelike style that dominates 2D action today should check it out.